Join Me For A Proverb A Day! Last week I shared with you the daily practice that has changed my life – reading/listening to one chapter of Proverbs every day. Several of you commented that this is something you’d like to make part of your daily routine and I’m so excited to hear that! You can start reading the chapter of Proverbs that corresponds to the date any time, but I thought it would be fun to read through it together starting in July. I’m inviting you to join me as we read through Proverbs together! You can use the plan without being in the group if you prefer – here’s the link for the plan that you can follow on your own, any time. Of course you can do it the old fashioned way and just open your Bible and read it right from the pages! 😉 That’s always a good idea. 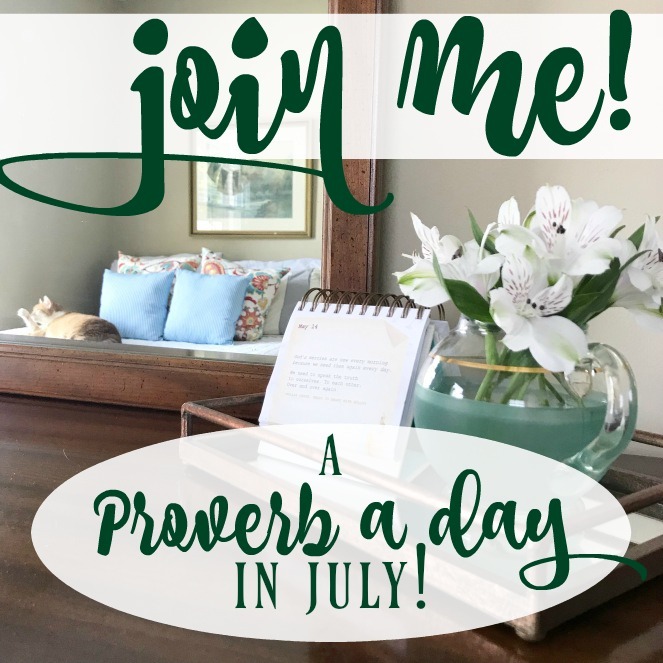 I hope you’ll join me for the month of July as we read through Proverbs! I won’t post reminders here on the blog, but I’ll try to do that on Instagram stories each day. Just a reminder, the 40-day reading plan Summer of Psalms for Busy Moms (aff link) is still available from my friend Sarah Frazer. In this plan you can read the Psalm, journal your thoughts and answer reflection questions all in one place! All of this can be done in 10 minutes. Right now you can download the book for only $7! Who’s in for a Proverb a day in July?